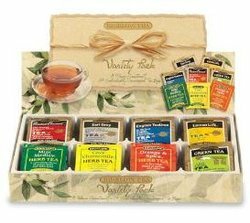 Bigelow Variety / Assortment Tea Box. 8 of your favorite teas, in one convenient variety pack. Made up of the following, Constant Comment, Lemon Lift, Green Tea, Earl Grey, English Tea Time, Orange & Spice, Cozy Chamomile and Raspberry Royal. Each kit has 64 total packs of tea in a nice shrink wrapped box. Great for the home, office or a under $15 gift! !